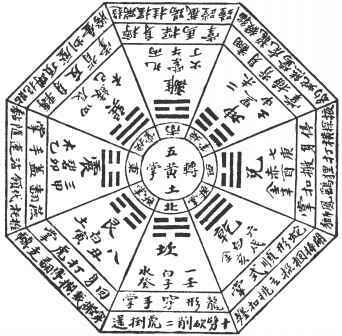 The method of Pa Kua taught to me by Mr. Hung I-Mien consisted of three sections: The Twenty Four Gates, the "Post Birth" or "After Heaven" sequence (often termed "The Sixty-Four"), and the "Before Heaven" sequence, which the readers will recognize as the circle walking Pa Kua. According to Teacher Hung (he preferred the term "Teacher" to "Master") this was the same sequence he learned from his teacher, Chang Chun-Feng. The readers should note that Chang preferred his students to acquire skill in Hsing-I as a prerequisite. Following in this tradition I too studied Chang's Hsing-I system which differs from other types of Hsing-I and contains shadings of Pa Kua as preparation to going into the Pa Kua curriculum. In Chang's text, Chou T'ien Shu, he states, "The beginner must learn Hsing-I, it is obvious . . ." He further explains that this gives the student an appreciation of basics both physical (technique) and psychological (courage). By beginning with these he believed students could rid themselves of petty fears regarding self defense and direct their attention to the more advanced mind and body training he found in Pa Kua which he describes as, ". . . covert and continuous." This is not to imply deep skill cannot be derived from Hsing-I but merely emphasizes the fact both teachers taught these arts in sequence as a curriculum. After gaining some skill in Hsing-I and the Twenty-Four Actions of "Heavenly Gates" the student begins learning the "Post Heaven" movements. The movements described and demonstrated here are the second series of the Water Kua. (Eight Sets for each of the Eight Kua giving 64 sets). The form is the tenth of the sixty four and is called ts'ang, or "conceal."